Prosthetic Eye for Evisceration | Ocular Prosthetics, Inc.
Evisceration surgery is a type of ocular surgery performed by an oculoplastic surgeon. The surgery is characterized by removal of the eye’s contents, leaving the scleral shell and extraocular muscles intact. This type of surgery is performed on patients suffering from painful blind eyes usually unresponsive to antibiotics. Removal of the eye can relieve pain and negate the need for further antibiotic treatment. Upon the time of the evisceration, the surgeon typically implants an orbital implant within the globe to restore lost volume to the eye socket. 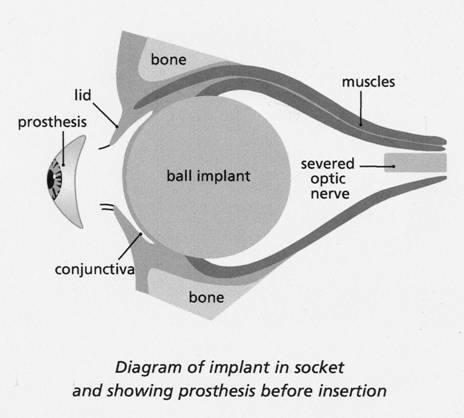 The implant will also enhance the movement of the ocular prosthesis and eyelids. 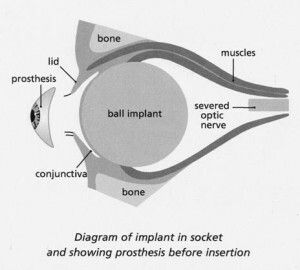 This two part system of orbital implant and prosthetic eye provides an aesthetic restoration that is both stable and well tolerated by the body. Although vision is not restored by an evisceration procedure, a natural appearance with a prosthetic eye can be achieved. The ocular prosthesis, aided by the intact extraocular muscles, will be able to track and move simultaneously with the other natural eye. If not impaired by trauma, the eyelids will also move and blink over the prosthesis normally as well. For more information on prosthetic eye treatment for evisceration surgery please contact Ocular Prosthetics, Inc today. Our team of board certified ocularists are happy to answer any questions or concerns you may have. We look forward to hearing from you.